The problem with Smart Charts is that MetaStock™ stores them "inside" a data history. If a fresh version of the history is installed, the pre-existing Smart Charts are lost. The Smart Charts Copier is a tool to assist clients in retaining their MetaStock™ Smart Charts after installing a replacement history. If you re-install a history (without first deleting or un-installing the existing history) the history installer will rename the existing history folder to preserve a copy of it as a backup. Similarly, if you upgrade from a "trial" history to a "full" history. If you re-install the ASX history, the installer will rename the existing "ASX" folder to "ASX(Previous Installation)" before installing a fresh "ASX" folder. If you re-install the Futures history, the installer will rename the existing "Futures" folder to "Futures(Previous Installation)" before installing a fresh "Futures" folder. The back-up history folder contains the pre-existing Smart Charts. These Smart Charts can then be transferred to the new history folder using the Smart Charts Copier. 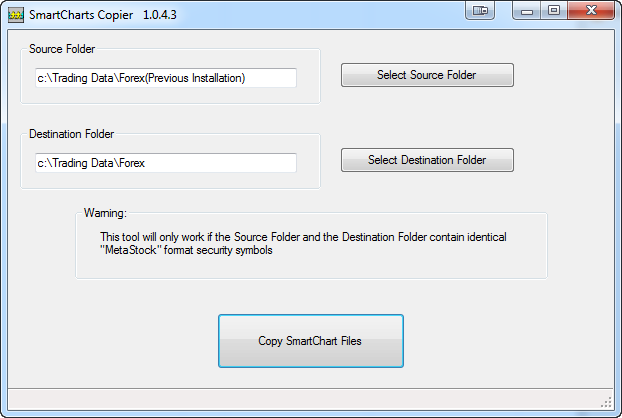 The illustration below shows the Smart Charts Copier being set up to transfer pre-existing Smart Charts after a Forex history re-installation. The Smart Charts Copier is available free-of-charge to subscribers and trial users. You will find the Smart Charts Copier in our Downloads Area. Please note that we cannot guarantee that it will work in all cases.